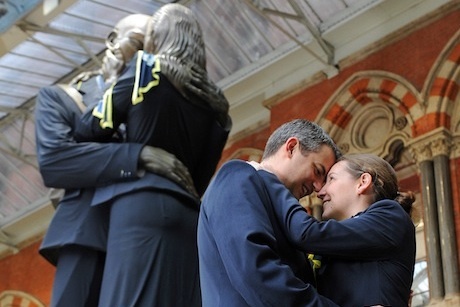 The 'kissing couple' statues at St Pancras station will be wearing Eurostar's new crew uniforms until the end of the week. The train operator engineered the stunt in a bid to publicise the revamp, its first in nearly a decade. According to Eurostar the project, which culminated with an unveiling at 5am today, was "a closely guarded secret for several months". The nine-metre high statues were dressed by Sharon Osborne’s stylist Maggie Cooke. To add to the shot’s interest two Eurostar staff who recently celebrated their first wedding anniversary, Simon and Adele Gent, recreated the pose. The name of the sculpture is ‘The Meeting Place’ and it was created by Paul Day.